Those are specific to 74 and 75 Cherokees. I am familiar with a nice set of tan ones saved for a 74 Cherokee project in Tucson. 1977 J10 - It's BLUE. I've held on to this set because I love that 1970's style, but I haven't used them because the cream color doesn't work for me. I've debated from time to time the thought of dying the vinyl in two tones, with black for the grain and latigo for the floral print, but without a clear vision of how I would transition between the two (some kind of chrome strip or leatherette piping) I don't see it being worth the risk of wrecking them. Reminds me of the embossing on fancy saddles. I suspect that's what it's supposed to be imitating. That's exactly why I want to dye it! 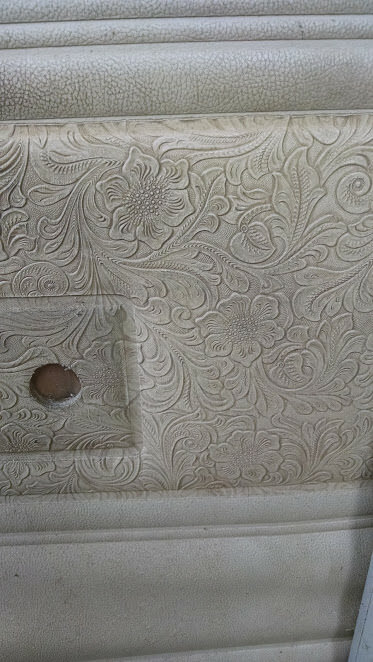 The method of tanning saddle leather is called "latigo" which is why I want the floral to be that color. Mine are black . What I like. Backs are fibber board not cardboard .Flowers on every panel in jeep . I have many style black interior panels for Cherokees and I picked these. OH AND THE ARMRESTS ARE COOL TOO . Custom to my liking ...... Armrests where taken apart to remove the black plastic backing and replaced with chrome backs from gremlin .matador .hornet .pacer .Plastic chrome looks good on black . .
Do you have some pictures fsj454? I'd love to see that!